When I left Tuscany (see Travels in Chianti Classico), I journeyed north and west to Liguria, the crescent-shaped region that is Italy’s Riviera. I stayed in the town of Lerici, a beautiful place not far from Tuscany on the Ligurian Sea. The native wine there is Vermentino, which is a pleasant white that goes well with the abundant and wonderful local seafood. Liguria is also known as the home of the best pesto in the world and you won’t get an argument from me about that. It was head and shoulders above any I’ve ever had. However, after a few days I headed further north to the home of some of the best wine and food in Italy, Piedmont (or Piemonte, as the Italians say). Piedmont, which means at the foot of the mountain in Italian, is right up against the Alps. It is at a higher altitude than Tuscany and has steep hills, rather than the gentle rolling hills of Tuscany. There are woods in Tuscany but not in Piedmont, just vineyards. Everywhere you look in any direction you will see grapes. They are like grass in the US. 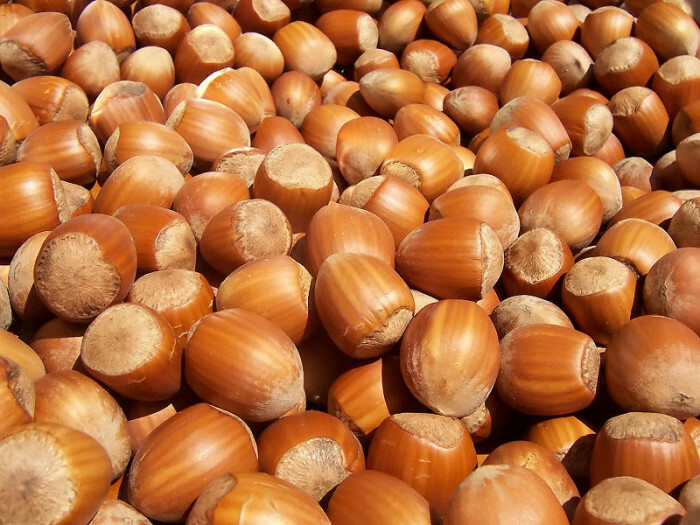 You will, however, see a lot of hazelnut trees which seem to be the counterpart to the olive trees that are everywhere in Tuscany. Frankly, Piedmont should not be compared to Tuscany. Its logical soul mate is Burgundy. Both places produce wine on family estates made up of relatively small parcels of land. Both produce their greatest wine from a single, perfectly adapted grape, Pinot Noir in Burgundy and Nebbiolo in Piedmont. Both are also known for having some of the best food in the world. Even the shapes of their bottles are similar. When I first became aware of “Northern Italian Food” it seemed to be positioned in the US as a lighter alternative to the heavy pasta with meatballs and lasagnas in the south. Nothing could be farther from the truth. In addition to the famous truffles this area is known for its fabulous game, veal, stuffed vegetables, rice dishes, cheeses and big time desserts. Butter, eggs and other French ingredients are common here. There is a dish called fonduta which is a variation on Swiss fondue. Piedmont borders on both France and Switzerland and, although the people are loath to admit it, the region is very influenced by both. In fact, it was ruled by the French House of Savoy for over 500 years. With a relatively cool climate and very hearty food it is not surprising that it is most famous for Barolo and Barbaresco, a couple of very big red wines. I began my exploration of Piedmont by hiring a guide, who was also a local food and wine writer, to take me around the area and to set up visits to some wineries. This turned out to be a good idea because the guy was very knowledgeable and pleasant to be with. Winery visits must be arranged in advance and it helps a lot if you are accompanied by someone the winery knows, and Piedmont is not the easiest place to navigate. If you do Piedmont on your own get a very good map or a GPS system. The roads are not well marked. My first surprise was the sheer number of different wines that are produced in Piedmont, many of which I was not familiar with. There are two main winegrowing areas. The Lange Hills is the area that most people think of first because it is home to the region’s most famous wines, Barolo and Barbaresco. A good deal of Barbera is also grown in this area, particularly around the regional capital of Alba and the nearby town of Asti. The Barbera of Alba is generally smoother and more elegant that that of Asti, but there’s not much wrong with a good Barbera d’Asti. The area makes a good Dolcetto; a light fruity wine with a hint of bitterness that I have always been a fan of but the Italians apparently think is not very interesting. There is also Freisa, a simple red wine that is good with things like charcuttiere and antipasto. Pelaverga is a light red wine that looks like a rosé and is only produced in the towns of Verduno and Saluzzo. Arneis is a dry white wine, full-bodied with light pear flavors, that has become the “in” white in northern Italy. It is a very pleasant wine that is good with starters and seafood. Blange is a famous label for Arneis and has become a status symbol in Milan. Barolo Chinato is Barolo wine spiked with quinine and spices. It is used as an aperitif, sometimes on the rocks, or mixed with lemon as grog. Moscato d’Asti is a low alcohol wine (about 5 ½%) that is a dessert wine but is also used as an aperitif. Moscato is also used to make the light, slightly sweet sparkling wine Asti Spumante, now officially known as Asti. Additionally, some international grapes are grown in this area including Chardonnay, Cabernet Sauvignon, Cabernet Franc and Merlot. There are some blends such as a Cabernet/Barbera, but blending, the norm in the rest of Italy, is not a very common thing in Piedmont. The other main area is Monferret which is close to the Langhe. Here Barbera is the main wine. It can be still or a little fizzy, or frizzante as the Italians say. Paolo, my guide, told me that a little bit of Freisa or Bonardo is often added to the Barbera here. Dolcetto is also made here in several towns such as Dogliani, Ovada and Diano. Grignolino is a light red used with starters and good with seafood. Ruche is a red produced in Castagnole that is full bodied and very aromatic. I never got to try one but Paolo told me it was hard to pair with food but goes well with roast beef with lots of garlic. It is also used as an after dinner “meditation wine”, a new concept to me. It also works with chocolate. Freisa is quite popular in Monferrat as is Bonardo. Cisterna was recently named a DOC appellation for Bonardo. Cortese, the white grape that produces Gavi, is made here but has fallen in popularity recently under competition from wines from other areas of Italy, particularly Sicily, Puglia and Naples. The area produces a host of dessert wines including Moscatos from several areas with varying levels of sweetness, Malvasia (very floral, rose color, good with fruit salad), Brachetto (similar to Malvasia) and a dessert version of Friese that is good with Hazelnut pie and cookies. There are even more wines that are only produced in small towns. Many farmers left the Monferrat area in the 50’s and 60’s after the war to work in Turin. They are now returning to the fields and producing wine. This did not happen as much in the Lange so winemaking continued there and that area became better known. In Piedmont the art of winemaking has been handed down to new generations within families for a long time. Historically there has not been much schooling so people tended to stick with tradition. This has changed in recent years and there are now foreign winemakers and new techniques in evidence everywhere. An idea like aggressive pruning---to improve the concentration of the resulting wine---is new here. At first it was considered blasphemy to waste what God gave you, but the technique has caught on. 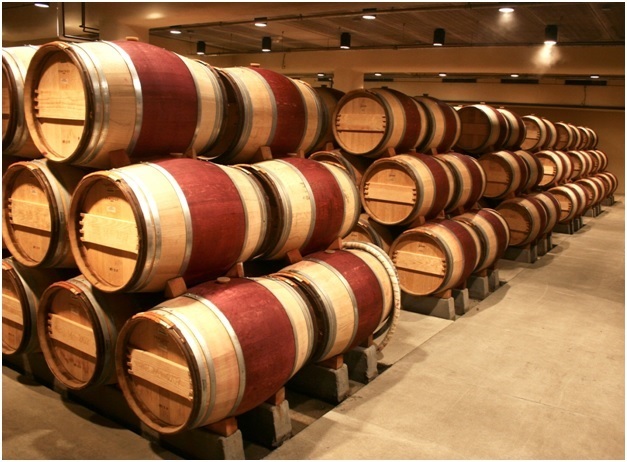 New winemakers also introduced French oak, or barriques, into Piedmont to complement the traditional oak casks used there. The French oak has larger pores which allow more contact with the air, which means a faster evolution of the wine. These two new techniques have revolutionized winemaking in Piedmont and given us wines that can be consumed much earlier. Of course, not everyone has bought in to this new style and arguments abound between the traditionalists and the modernists. But if the wine is well made it’s hard to criticize either style, and I was told of several blind tastings that showed that after 15 years it’s impossible to tell which style was used to produce the wine. Like the Sangiovese grape of Tuscany, the Nebbiolo grape is extremely sensitive to place and can show very differently if it is moved even a small distance. Barolo and Barbaresco are really the ultimate example of this. Barolo is known as the King of Wines and the Wine of Kings. This is due to a smart Contessa who sent some Barolo to the King in Turin years ago, and the image has stuck ever since. Barolo, released after 4 years, is always described as the more masculine of the two. It tends to taste of mushrooms, leaves, spices and licorice. 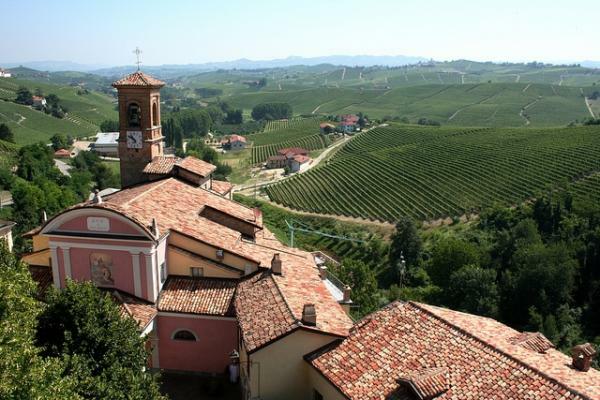 It is produced on about 1300 hectares of land around the small town of Barolo. Barbaresco is produced on about 500 hectares of land around the even smaller town of the same name. The town of Barbaresco is a church, a store, and a few restaurants surrounded by over 100 wineries. If you blink, you miss it. Barbaresco, which is released after three years, is considered more feminine and ready to drink earlier. Its impression is more floral (violets and jasmine), and its spices are sweeter (anise, marzipan, cumin.) 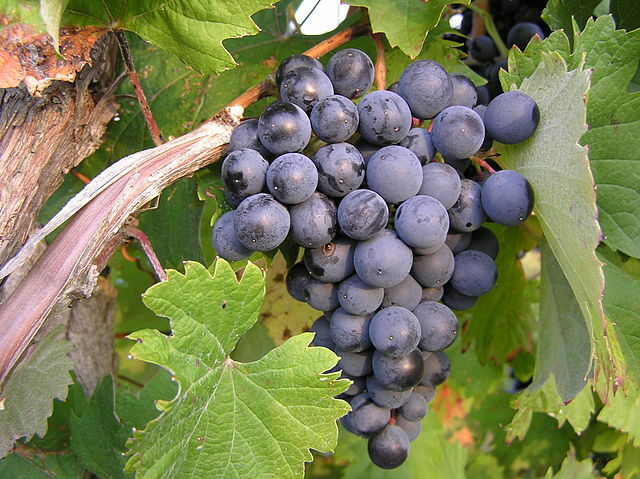 However, both wines are made from the same grape in almost exactly the same way. The difference is soil and microclimate. Barolo is a little higher, a little cooler. Barbaresco is closer to a river so it’s a little more humid, but the main difference is soil. Since the villages are only 10 miles apart they show the great effect that terroir has on the Nebbiolo grape. For this reason, you almost never see Nebbiolo outside of Piedmont. It would make a completely different wine. Although blending different grapes is not common in Piedmont, blending different Barolos (or Barbarescos) is. The idea is not to blend different wines but to blend different soils and different exposures to the sun. 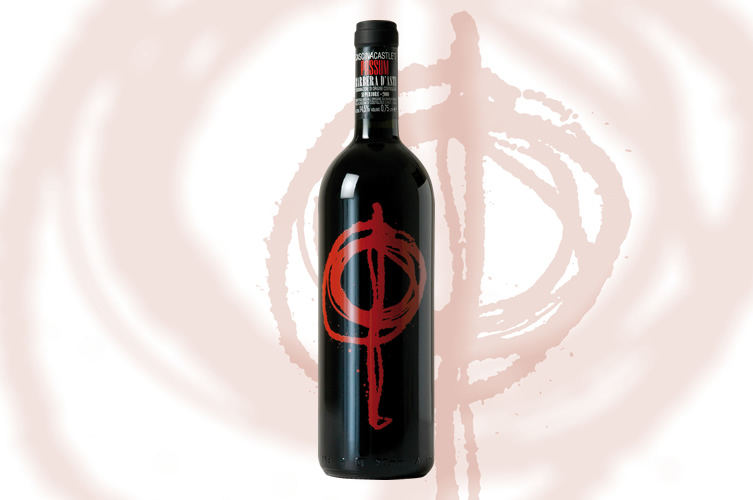 This can give a more elegant, rounded and balanced wine. The idea of a single vineyard wine is more of a French concept and does not seem to be considered a good idea in Italy. My first winery visit was to Cascina Castlet in the village of Costigliole d’Asti in the Monferret region, a winery covering about 18 hectares. The owners are two sisters who have been managing the business since the 1970’s. They respect tradition but have introduced modern techniques where ever they feel it helps them to express the quality of their wines. You can see this attitude in their very modern, graphically enhanced labels. They produce five Barberas and two Moscatos. The differences are where the grapes are grown, the exposure to the sun, the age of the vines, whether the wine is stored in steel or oak. They use both Austrian and French oak, both in the unique oval style of barrels in Piedmont. Their wines are available in the US. Their GOJ 2006 is a fizzy Barbera (due to a secondary fermentation) that you would think was bad if you didn’t know it was supposed to be that way. Barberas like this are a tradition in Monferret. It was light, pleasant, and very refreshing, a wine meant to be consumed young. Their Barbera d’Asti 2006 was a classic Barbera from grapes grown on a variety of hillsides. Fermentation is temperature controlled. It’s a full bodied, ruby red wine meant to be served with starters. It costs about $12 in the US. The Barbera Litina 2005 is made from older, lower yield vines and spends at least 6 months in oak and then a year in the bottle. It is smoother and more intense and costs about $14. Passum is a Barbera that is allowed to ripen more, spending time in both large and small barrels. A lot of water is lost as the wine matures in the barrels so this wine has more concentrated sugars. Their best grapes are used for this wine. It was an outstanding Barbera: warm, smooth and velvety, a wine that you could serve with game, roasts and cheese. It was also referred to as a meditation wine. It retails for $25 to $30. Policalpo is a blend of 70% Barbera and 30% Cabernet Sauvignon which was made because they felt like making a more international wine. It sells for about $20 and was not impressive. Their Moscato d’ Asti had a little fizz, was not too sweet and was a very good and refreshing wine. I know I’ve ranted about this in the past, but I don’t understand why wines like this are not more popular in the US. They are wonderful and a bargain at $12. “How ya doing, Mate?” was about the last thing I expected to hear as we pulled into the Marchesi di Gresy Estate in Barbaresco, but Jeffrey Chilcott, who is the cellarmaster, is from New Zealand. He is the embodiment of the new style of wine in the Langhe: less wood, not as much fermentation or contact with the skins, and lower yields. I was in their Martinenga vineyard but they have three other properties scattered around Piedmont. They produce about 200,000 bottles, 35% of which goes to the US. They sell all over the world but a lot of their wine goes to tourists from Europe who drive here and then bring the wines home at a good discount. Their Langhe 2006 is a European style Sauvignon Blanc that was crisp, refreshing and surprisingly good. It sells for $18 in the US. Monte Aribaldo 2005 was a Dolcetto D’Alba 2005 that is made with no oak. It’s elegant, smooth and fresh with low acid and low tannin. I liked this wine which sells for about $18. The Nebbiolo Martinenga 2005 also uses no oak. The first few rows of Nebbiolo are picked for this wine. It is for drinking now but can age for 3 years. It will give you the idea of Nebbiolo for about $22 a bottle. It was fresh and pleasant with good body for an unoaked wine. 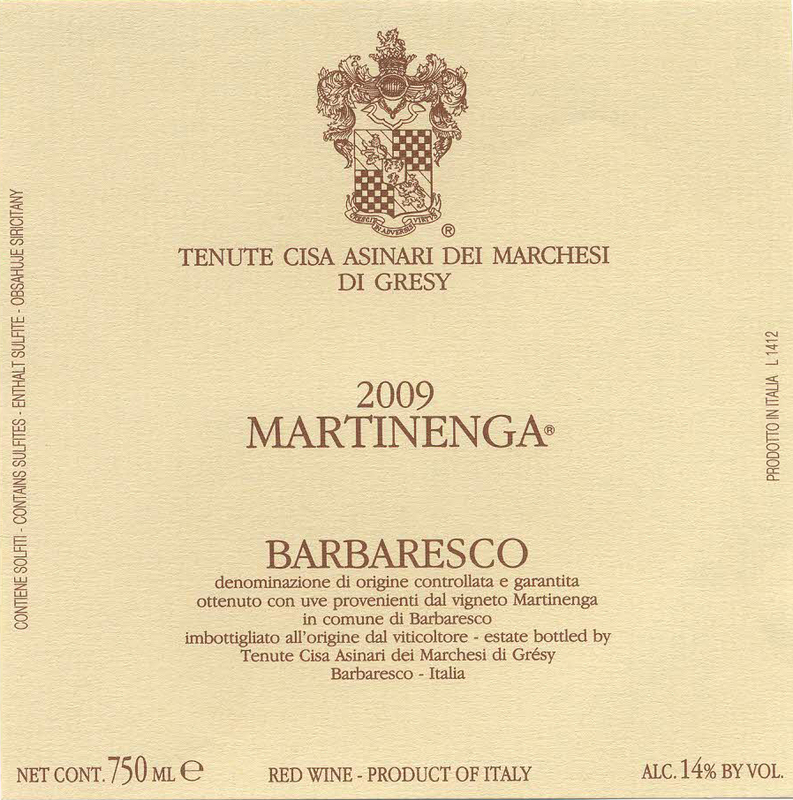 The Martinenga Barbaresco 2003 spends ten months in French oak, nine months in traditional oak and at least one year in the bottle. This is probably the wine they are best known for. It is jammy, rich in structure with a substantial backbone and well balanced. It costs about $42 and is worth it for a wine of this quality. The Camp Gros Barbaresco 2000, which sells for a little less, was actually my favorite. Aged in French oak, it is made in only the best vintages. It is an earthy wine that could easily stand up to wild game or aged cheese. Gaiun Barbaresco 2001 was the same general idea but more flowery and very elegant. They also make a Moscato d’Asti that is very full, fruity and an excellent dessert wine. I liked this one a lot also. These are excellent, well priced wines and are worth seeking out. Their Dolcetto D’Alba 2006 is produced without wood and is a pleasant but unexceptional wine. On the other hand, their Coste and Fossati Dolcetto D’Alba was outstanding. It costs about 15 Euros in Italy and was not acidic or tannic in any way. They said it can age for ten years. Barbara D’ Alba Superiore 2004 was a very nice, smooth wine but was 20 Euros which would make it prohibitive in the US. The Barolo Albe 2002 was made with grapes from all over their vineyard and was a beautiful, elegant wine. And I got to try their Barolo Chinato. This was the wine made with quinine, cardamom, rhubarb, cinnamon, rose pedals, lemon zest, and other unlikely ingredients. It is used before or after dinner, sometimes on the rocks. This was an interesting experience but way too intense for me. It must be an acquired taste. Piedmont loves visitors. They want people to be familiar with their wines. I think they are making wines from international varietals just to get into some markets and then sell their Barolos, Barbarescos, Dolcettos and Barberas. You will be made to feel very welcome here. They want some of the tourists from Tuscany. If they didn’t make wine at all it would still be worth going for the food. We had the best veal ever in Piedmont, served thick and rare. If you’re a fan of rabbit, boar and other game this is a great place to try them. They are feeling foreign competition in the midrange wines and prices, which went too high years ago, are coming down. At the same time quality is going up, particularly in the Barberas. These are great wines to get familiar with. There is a trend to blends among the more modern wineries. This is not a skill that has been developed in Piedmont and is part of the reason that foreign winemakers are being employed here. Tradition is respected but a lot of wineries are trying all sorts of new things. My guide had a ten liter bag-in-the-box in his trunk. It was a premium Barbera from a cooperative firm in Monferrat. It cost 18.50 Euros and he assured me that the quality was excellent and kept consistent for at least a month. There are wine bars in all cities of any size where the wines of the region can be sampled. One, the Enoteca Regionale in Acqui Terme where I stayed, was in the foundations of a Roman building dating from the 11th century and might have been the coolest wine bar I’ve ever been in. Share your experiences in the Piemonte region of Italy! Have you traveled in Piemonte? If so, how did your experience compare to this article? What are your favorite wines? Share your comments and insights with the community!